NEW 3-Piece spooky signs for haunted house, yard, dungeon, graveyard tombstone cemetery scene, crafts, prop building or costume party wall decor. Each approx. 15-inch (37.5cm) High x 9-inch (22.5cm) Wide x 1-inch (2.5cm) Thick and made of lightweight high density Polystyrene (poly-Styrofoam). 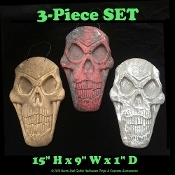 Creepy realistic 3-dimensional sculpted detail paint washed stone-look in 3 colors, as pictured: BROWN, GRAY, RED. *3-Pieces: 1-each of all 3-Colors in each SET. Bone chilling design to use alone or together. Most have Black string hangers (*NOTE: Some do not have hanging strings) to hang on wall, door or cemetery fence. Each in original factory cellophane package shrink wrap. *Light weight, so if used outside, we recommend you mount it to a sturdy surface to prevent loss or damage.